After fighting our way through crowds of TukTuk’s, taxi’s, buses and everything else imaginable on Delhi’s crowded streets the AIG team ventured underground and found a calm, efficient, modern oasis of a public transport system that would be the pride of Manhattan if relocated. 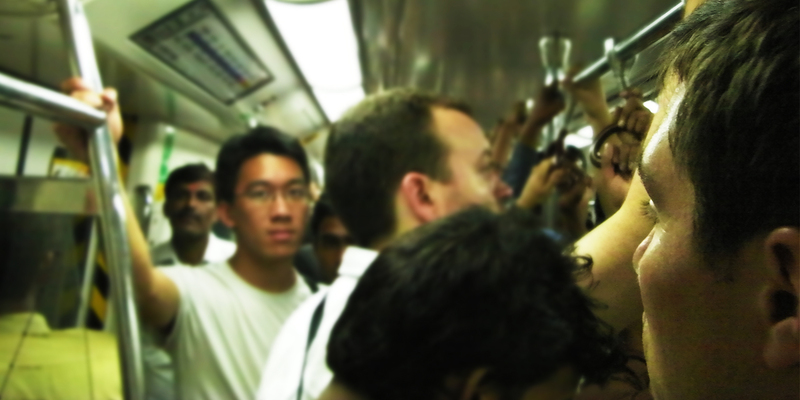 The Delhi Metro runs about every minute at rush hour, a fact discovered by the AIG when they missed the southbound Yellow Line by mere yards and began loudly bemoaning their bad luck…only to feel rather foolish as the next one rolled in within seconds. The Delhi Metro opened in 2002 and is rapidly expanding which is a common theme in these parts. No riding on the roof, ladies get their own carriage and photography is prohibited. This entry was posted in Places, Transport, Travel and tagged Delhi, India, Metro, Transport. Is the subway station as hot as the ones in Manhattan? Are the trains airconditioned? The trains and stations are air conditioned. It is really a great example of public transport and something NYC could learn from.